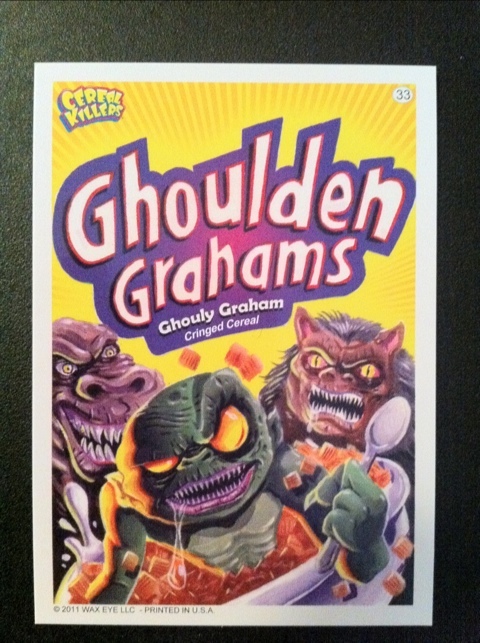 Recently Shawn Robare over at Branded In The 80’s had a contest for some of the doubles of the Cereal Killers cards he had left over and guess who won. Me! Let me just start by saying Shawn really knows how to package trading cards. These things showed up in my mailbox in a hard cardboard envelope that was put into another envelope and taped as tight as a Christmas gift with DO NOT BEND on the front. Cheers to you, sir. These puppies were mint. As I carefully opened the envelope and removed the cards I began to study them intensely. That’s when it happened. With a sudden rush of nostalgia I was 10 again, cataloging my Garbage Pail Kids collection, checking numbers, backs and puzzle pieces. My Garbage Pail Kids collection has gone the way of the Dodo bird and these make me miss them again. So what do I do? TO EBAY! I’ve started gobbling up any I can find that are in at least decent condition. 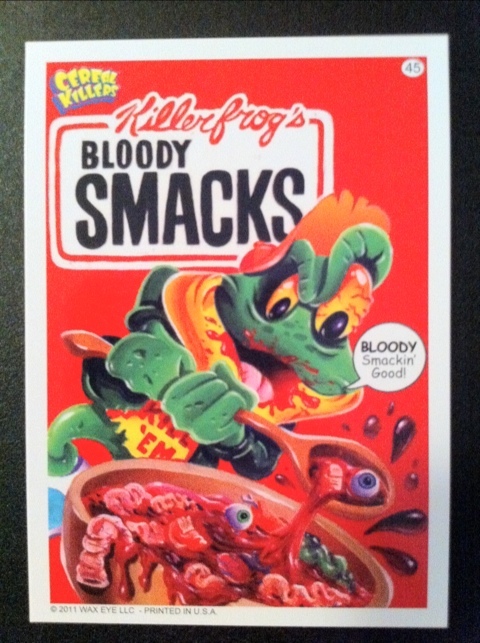 The Cereal Killers trading cards are written and painted by none other than Garbage Pail Kids artist Joe Smiko! That would explain why most of you reading this have noticed that sudden obsession swelling up on you. The same obsession, that as a kid, had you bugging your mom constantly to take you to the store to buy as many Garbage Pail Kids packs as you could and then when she wasn’t looking put 3 more packs on the counter.Well, it’s become a little easier these days. You can head over to Wax Eye’s store and order the 3-Pack Mini Cereal Box Set for $24.95. 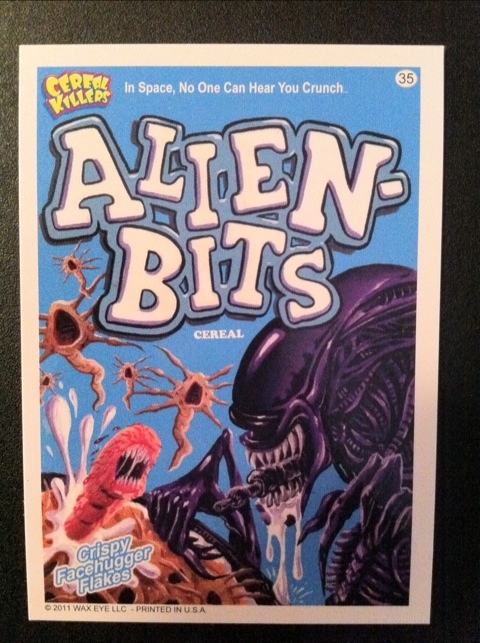 You read that right, they come in freakin’ mini cereal boxes! There are 20 cards in each box for a total of 60 cards. If you really want to get your collection started off right, might I suggest the CASE of 10 3-Pack Mini-Cereal Box sets for $224.55. Be one of the first 50 people to buy 3 cases and you will receive a FREE signed and numbered 40″ x 25″ Cereal Killers uncut card sheet. 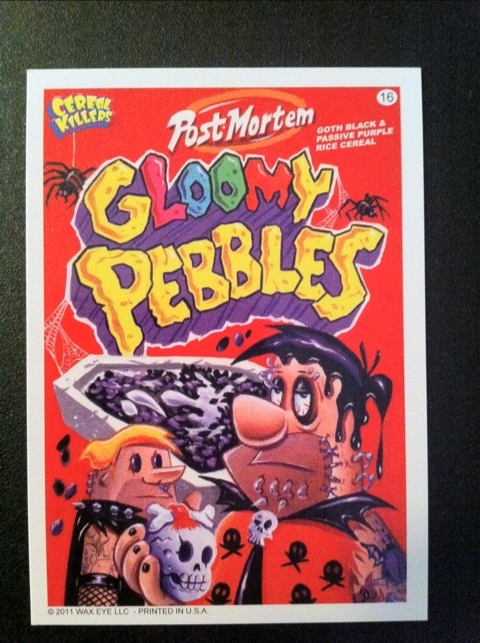 This is the first series and contains 55 cards so don’t slack or you’ll end up looking like Gloomy Fred down there. Now I need to figure out how to sneak 3 cases onto the counter bank statement. Jeremy- those cards look awesome! I might have to look into that deal on the case. An uncut sheet of these would look pretty sweet hanging in the cave. Does anyone know if there are posters made like these cards?